C.T. 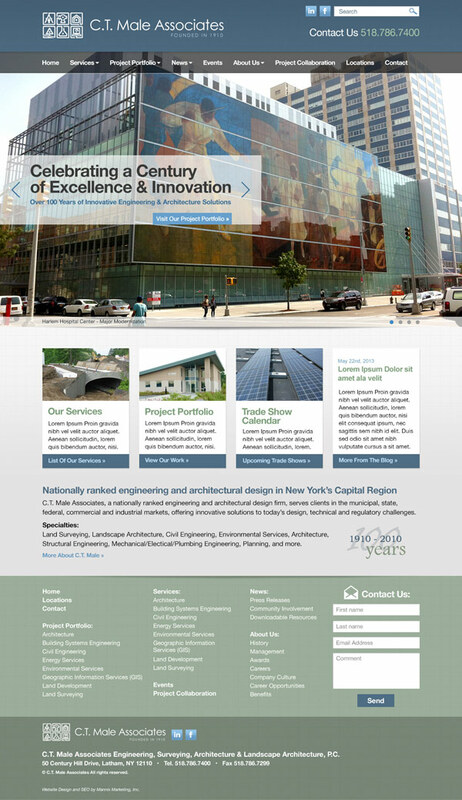 Male Associates is a nationally ranked engineering and architectural design firm in the Capital Region. For over 100 years, C.T. Male Associates has served a diversified mix of public and private clients specializing in architectural services, building system engineering, energy services, environmental consulting and land surveying services. They sought a website design that conveyed the level of experience, professionalism and precision they are known for providing. We designed an engineering website that showcased their work at different stages of development with an oversized slideshow of images. Strong calls to action funnel users to view their portfolio, which further hammers home their extraordinary work and versatility. Mannix Marketing was hired to design a responsive (mobile friendly), search engine optimized, easily updateable website.